It’s possible that Korczak Ziolkowski’s Crazy Horse Memorial will never be finished. He sculpture, which when finished will be the size of a literal mountain because it is sculpted from a literal mountain, has been in progress for 70 years, with no end date in sight. The original idea was a tad bit ambitious. “When completed, the horse's eye was to be 18 feet wide and 16 feet high; the head was to be 22 stories high.” Korczak died 35 years into the project and his wife Ruth, who is 18 years his junior has carried on his legacy saying, “The important thing is that we never stop. That’s the main thing. And if you looked at it as strictly a view of being finished, you could get awfully distracted waiting for that day to come. This way, you’re pleased with every little step of progress that you make.” She may be lying to herself, but it is a lie that’s working for her and her seven out of ten children who are also working on the Crazy Horse Memorial. The idea for the monument was conceived by Oglala Lakota Chief, Henry Standing Bear. He wanted to honor the Lakota warrior, Crazy Horse, who fought the U.S. military against encroachment on Native American land in two infamous battles: the Fetterman Fight, and the Battle of Little Bighorn. (Spoiler alert) Eventually, Crazy Horse surrendered and the land was taken from the Native Americans. But even after admitting defeat, Crazy Horse “was bayoneted in the back and died when soldiers attempted to throw him into the guardhouse at Camp Robinson, Neb., Sept. 6, 1877.” This was obviously a power move since Crazy Horse actually had a chance of deterring their conquest of the west. So Crazy Horse died because of the American settlers’ collective ego, but was not forgotten by the Native Americans. Henry Standing Bear’s older brother, Luther Standing Bear, tried to convince Gutzon Borglum, the sculptor of Mount Rushmore, that Crazy Horse should be added to the face of the mountain, but to no avail. Then, 70 years later Henry Standing Bear wrote to Korczak Ziolkowski, a sculptor under Borglum. He said, “My fellow chiefs and I would like the white man to know that the red man has great heroes, too." Ziolkowski agreed and the rest is history. The two scoped out the perfect spot in the Black Hills in South Dakota, and work started in 1948 and has continued ever since. This project is not without its controversy however. The descendants of Crazy Horse were never asked their opinion on the matter and let me tell you, they are not pleased. Elaine Quiver, one of said descendants explained, “They don’t respect our culture because we didn’t give permission for someone to carve the sacred Black Hills where our burial grounds are. They were there for us to enjoy and they were there for us to pray. But it wasn’t meant to be carved into images, which is very wrong for all of us. The more I think about it, the more it’s a desecration of our Indian culture. Not just Crazy Horse, but all of us.” It can’t be all bad though. The memorial will include a new on-site university, a Native American college scholarship program targeting Native high school kids, and an expansive museum, which may or may not be a bribe to make the corruption of the Black Hills and the burial grounds in them less upsetting to Crazy Horse’s descendents. 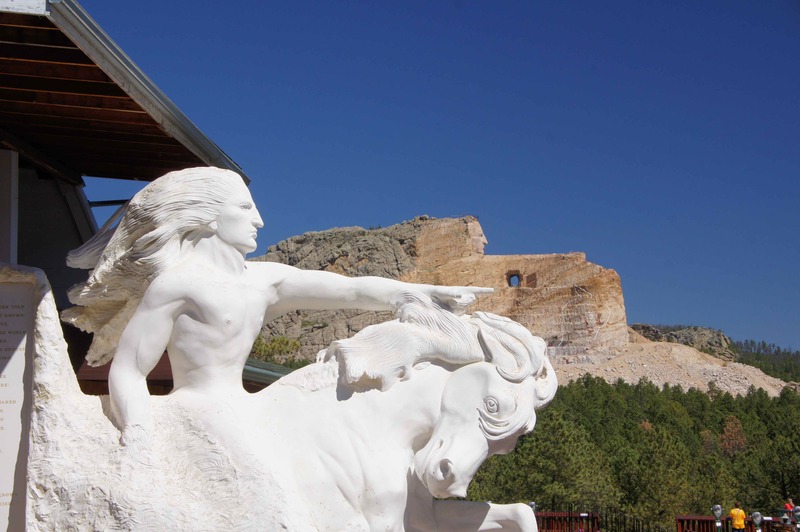 Crazy Horse Memorial Mission-Purpose South Dakota." Crazy Horse Memorial Foundation. N.p., 2015. Web. 20 Aug. 2018. Eschner, Kat. 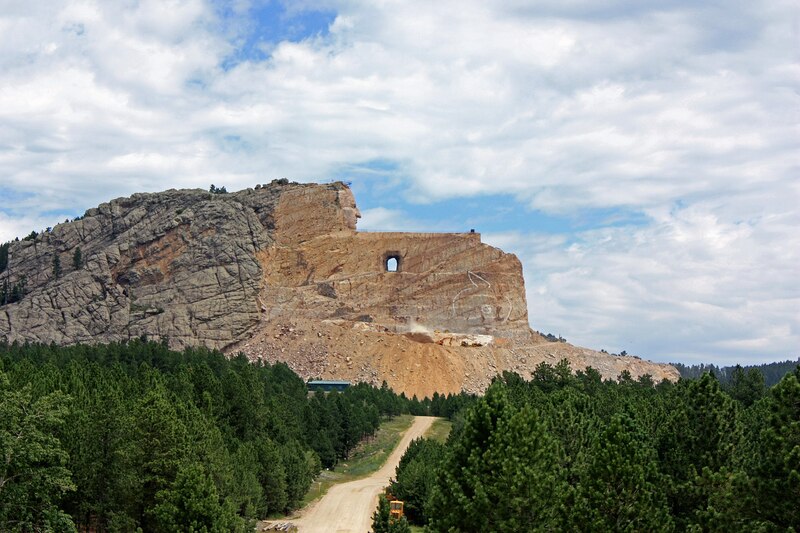 "The Memorial To Crazy Horse Has Been Under Construction For Almost 70 Years." Smithsonian. N.p., 2017. Web. 20 Aug. 2018. "KORCZAK ZIOLKOWSKI, SCULPTOR WHO PORTRAYED CRAZY HORSE." Nytimes.com. N.p., 1982. Web. 20 Aug. 2018. Ray, Charles Michael. "The Slow Carving Of The Crazy Horse Monument." Npr.org. N.p., 2013. Web. 20 Aug. 2018. 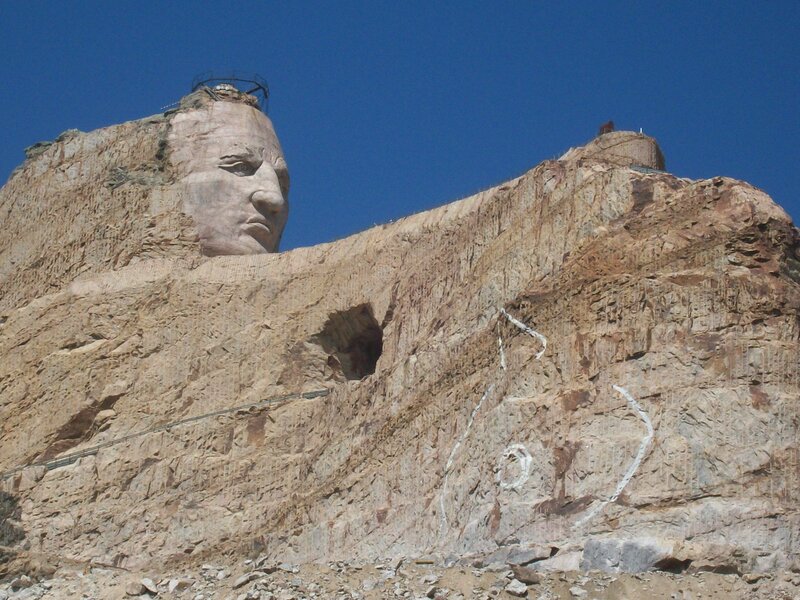 Check out the full Wikipedia article about Crazy Horse Memorial.